Many Greeks are gradually coming to terms with the collapse of a failing social and political system. They are taking matters into their own hands and addressing crucial issues through grassroots activism and local collective action. The solidarity initiatives offer solidarity in practice by activating citizens and supporting each other to survive, build collective strength, resist and build for an alternative better future. Faced with the growing suicide rate, an NGO and a collective of mental health professionals run a non-profit 24/7 suicide helpline and offer psychological support services in Athens. 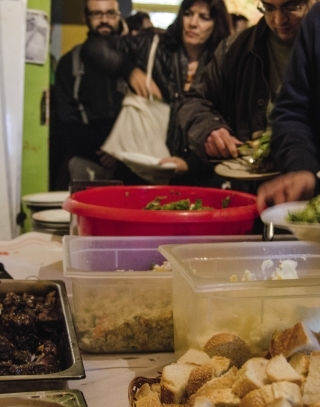 Read about these initiatives here and about three here – the Solidarity Network of Vyronas and the Solidarity Club of Neos Cosmos both in Athens and Participatory Table of Solidarity and Emancipation in Kavala (Northern Greece). Also see the reports from the Greece Solidarity Campaign delegations .